What is Turkey Like for a Holiday? Turkey is fast emerging as one of the most popular holiday destinations in Europe. Where once the Turkish tourism industry was struggling, it now flourishes and attracts thousands of visitors every year. As such a vast and constantly changing country, there is so much to discover while on holiday here and we present five aspects that will help you gain an idea of what Turkey is like for a holiday. As you’d expect, much of the tourism in Turkey is found along the coast in seaside resorts. Those who visit the Turquoise Coast fall in love with the sumptuous blue waters and rocky coastline. Here you’ll be able to find beaches to cater for all your tourist needs or, if you look a little further afield, you’ll be able to marvel at the peace and tranquility of a secluded cove. A great place to visit is the resort of Bodrum which has managed to maintain a fishing village atmosphere while catering for tourists. Here you’ll find whitewashed houses sitting pleasantly on the rolling hillside, breathtaking scenery and a vibrant nightlife. When deciding to spend your holiday in Turkey you can rest assured that the sun will shine all day, enabling you to bask in the glorious rays on the beach or by the pool. Average temperatures in the Mediterranean resorts are at about 28°C , whereas in the hottest time of the summer it can hit a sweltering 45°C – good job you’ll be able to dive into the crystal clear ocean to cool off! 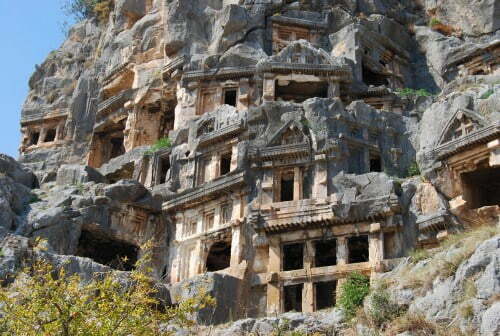 If you’re a history buff or you just like wandering around ancient sites, then Turkey is perfect for you. Here you’ll feast your eyes on ancient artefacts and places from the Roman, Byzantine and Ottoman empires along with many current religious buildings. For those visiting Istanbul, the city is awash with awe-inspiring architecture and historical treasures. You simply have to try the local food. Whether you eat out in top notch restaurants or do as the locals do and visit one of the many street vendors, you’ll know the food will be of top quality. Kebabs are a must, as are marinated meats and fresh breads which will keep your mouth watering. Don’t forget to try the local apple tea too. You can have all this on a budget too. With so many Turkey holiday deals available and a wide variety of accommodating packages for differing budgets you can find some fantastic savings and have an amazing time in Turkey. ive been to turkey many times, i cant say i am over fond of traditional turkish food though, too many veggies in it for me! i DO like kebabs though. Yes Sarah, prices for Turkey are quite cheap now. Especially all inclusive concept. Food checked, history checked, weather checked.. wait did you said price? That’s so awesome 🙂 totally right in my ally. Izmir and Istanbul are both great places to visit. If you are going to be in the tourist areas, there probably won’t be many changes ie the bars and restaurants will still be open but banks etc will be shut. Before you leave, do some internet research on expat publications and websites to find out events in the area. Also ask your hotel reception when you arrive if they know of any celebrations that you can attend. Don’t worry about any unusual etiquette situations as it is not a religious holiday. The emphasis is more on celebration than anything and locals will be glad to have you join in. We are going to be visiting Turkey (Izmir and Istanbul) around the end of October next year. With the trip being over the Republic Day, do you have any advice for first time visitors to get the most out of both the sites and the celebration? Any unusual etiquette situations we should be sensitive to, with our trip being over a major holiday? Great blog – it’s definitely been helpful for someone planning a trip to Turkey! I’d add the warmth and hospitality of the people. I cant wait to go to Turkey! !